While this behavior is really powerful, since your application adapts automatically to the device's configuration at runtime, it is sometimes confusing for new Android developers who wonder why their activity is destroyed and recreated. Facing this "issue," some developers choose to handle configuration changes themselves which is, in my opinion, a short-term solution that will complicate their life when other devices come out or when the application becomes more complex. The automatic resource handling is a very efficient and easy way to adapt your application's user interface to various devices and devices configurations. It sometimes comes at a price though. 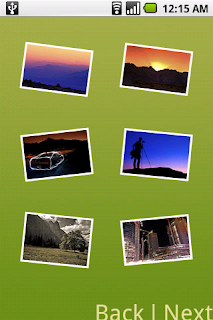 Photostream lets Android take care of the configuration change when the screen is rotated. However, can you imagine how painful it would be for the user to see all the images being downloaded again? The obvious solution to this problem is to temporarily cache the images. They could be cached on the SD card (if there's one), in the Application object, in a static field, etc. None of these techniques is adapted to the current situation: why should we bother caching the images when the screen is not rotated? Fortunately for us, Android offers a great API exactly for that purpose. Be very careful with the object you pass through onRetainNonConfigurationChange() though. If the object you pass is for some reason tied to the Activity/Context, you will leak all the views and resources of the activity. This means you should never pass a View, a Drawable, an Adapter, etc. Photostream for instance extracts the bitmaps from the drawables and pass the bitmaps only, not the drawables. Finally, remember that onRetainNonConfigurationChange() should be used only to retain data that is expensive to load. Otherwise, keep it simple and let Android do everything. Android is a mobile operating system meant to be run on a wide array of devices, with very different hardware configurations. Some devices, like the T-Mobile G1, can change their hardware configuration at runtime. For instance, when you open the keyboard, the screen change from the portrait orientation to the landscape orientation. To make Android applications development easier, the OS automatically handles configuration changes and restart the current activity with the new configuration. This is the default behavior that lets you declare resources like layouts and drawables based on the orientation, screen size, locale, etc. If you are not familiar with the way Android handles resources, I highly suggest you to read the official documentation on resources. to upload their application(s) along with end user pricing for the apps. Initially, priced applications will be available to end users in the US starting mid next week. We will add end user support for additional countries in the coming months. Also, Android Market for free applications will become available to users in Australia starting February 15th Pacific Time and in Singapore in the coming weeks. Developers can now make their applications available in these countries via the publisher website at http://market.android.com/publish. We look forward to seeing more great applications on Android Market. Despite the impressive hardware of the first Android phones (T-Mobile G1 and ADP1) writing efficient mobile applications is not always straightforward. Android applications rely on automatic memory management handled by Dalvik's garbage collector which can sometimes cause performance issues if you are not careful with memory allocations. In a performance sensitive code path, like the layout or drawing method of a view or the logic code of a game, any allocation comes at a price. 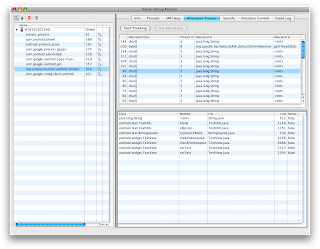 After too many allocations, the garbage collector will kick in and stop your application to let it free some memory. Most of the time, garbage collections happen fast enough for you not to notice. However, if a collection happens while you are scrolling through a list of items or while you are trying to defeat a foe in a game, you may suddenly see a drop in performance/responsiveness of the application. It's not unusual for a garbage collection to take 100 to 200 ms. For comparison, a smooth animation needs to draw each frame in 16 to 33 ms. If the animation is suddenly interrupted for 10 frames, you can be certain that your users will notice.